"Adventure wanted. Will go anyplace, do anything..."
In 1948, motion-picture actor Alan Ladd teamed up with an old business associate named Bernie Joslin and created Mayfair Productions, a radio syndication company. The reason for the name was because the two men had previously operated a chain of restaurants with the same moniker. Mayfair's primary contribution to radio entertainment was "Box Thirteen," a mystery/adventure series that featured the popular Paramount Pictures matinee idol in the lead role. 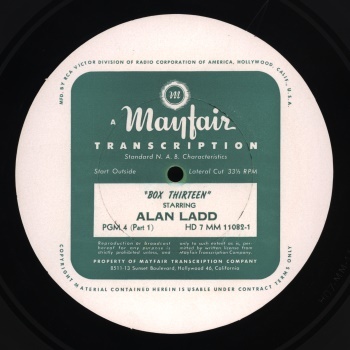 The series must have felt like old home week for Ladd; he had begun his acting career in 1935 at the Warner Brothers Studio-owned KFWB, working as many as 20 shows a week and, for a time, being heard as "The Richfield Reporter." While he spent seven years in radio, Ladd also strived to break into the movie business. Working as a grip on the Warner Bros. Studio lot, he also got on film as an extra and playing bit parts, such as a reporter in the 1941 classic 'Citizen Kane'. Ladd's big break came when he was cast as 'Raven', a psychotic killer with a conscience in Paramount's 'This Gun For Hire' in 1942. In "Box Thirteen," Ladd played Dan Holiday, a newspaper reporter who was now an author of mystery fiction. Interested in writing the most successful and thrilling stories possible, Holiday placed an ad in the paper he worked for - the Star-Times - that read: "Adventure wanted. Will go anyplace, do anything. Box Thirteen." Gathering material for his fiction this way, Holiday apparently was a prosperous and acclaimed writer as he rarely charged a fee to any of the colorful clients that crossed his path, most of whom needed his assistance in one way or another. His correspondence was attended to by a gal Friday named Suzy played by actress Sylvia Picker. Suzy was a slightly scatterbrained ditz that had the most unusual way of mangling the English language at least once every episode. For the most part, aside from sporadic appearances by Lieutenant Kling, the obligatory police contact played by Edmond McDonald, Dan and Suzy were the only two regulars heard on the show. Though "Box Thirteen" was produced specifically for syndication to local stations, it received a network run on the West Coast Mutual network from March 15, 1948 thru March 7, 1949 and was then heard on the East Coast over New York's WOR from August 22, 1948 thru August 14, 1949. Mayfair produced a total of 52 episodes, mostly scripted by Russell Hughes, the individual at KFWB who was responsible for hiring Ladd back in 1935 at the princely sum of $19.00 a week. (It would seem that Ladd looked out for his old friends; actress Picker was also an old KFWB colleague.) The program's music was supplied by Rudy Schrager, with the announcing chores handled by Vern Carstensen, who also doubled as the show's director. Despite the fact that "Box Thirteen's" budget was skimpier than most network mystery/adventure shows, all in all it was a fairly high-quality program, with witty, interesting scripts and appearances from many of radio's acting professionals: Betty Lou Gerson, Lurene Tuttle, Alan Reed, Joseph Kearns, Frank Lovejoy, John Beal, and others. 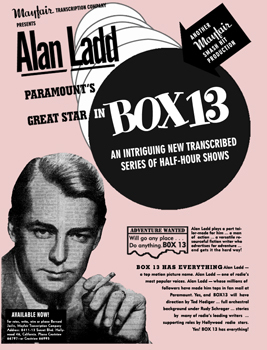 "Box Thirteen" had a short life beyond radio, showing up as an episode of 'General Electric Theater' on television in 1954 in an episode called Committed (a rewrite of one of the radio shows) with Ladd playing Dan Holiday. "Box Thirteen" is a prime example of Alan Ladd at his best. It allowed him to take the charisma and stoic presence apparent in his film roles to a medium he was familiar with. "Box Thirteen" was a well-written series that allowed the diminutive star to do what he did best: play his tough-guy persona to perfection in a novel program whose format guaranteed that its concept stood little chance of growing stale. 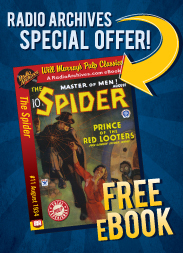 All fifty-two installments of the series have been preserved for the listening pleasure of old time radio fans and will be released in four Volumes, including the fourteen half-hour episodes in this collection, restored and remastered by Radio Archives.